Oh where, oh where have my little bees gone? Oh where, oh where can they beeeeeeeee? After all the talk about this year being ripe for swarms, I still wasn’t fast enough giving my Carniolan hive more space. They swarmed. The Carniolan breed is prone to swarming as it is, and this weather didn’t help. When bees run out of space in their hive, they swarm. 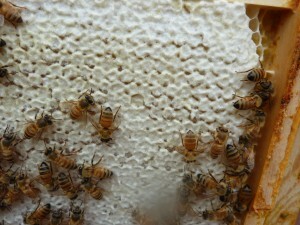 That means the queen and about half the bees leave the hive in search of a new home. The bees left behind should raise a new queen on their own. It’s nature’s way of increasing the population and ensuring survival of the species–two hives from one. BUT, beekeepers need to recognize the signs and manage their hives to prevent swarms. That’s good money flying out the door (literally). And it freaks out the neighbors, too. So that was three weeks ago. I didn’t know right away that they’d swarmed, but when I did my inspection at the time, I saw several queen cells. (They look like peanuts in a shell, hanging from the side of the comb.) Bees only build queen cells when there’s either something wrong with their queen or they’re about to swarm (or had just swarmed, in this case). 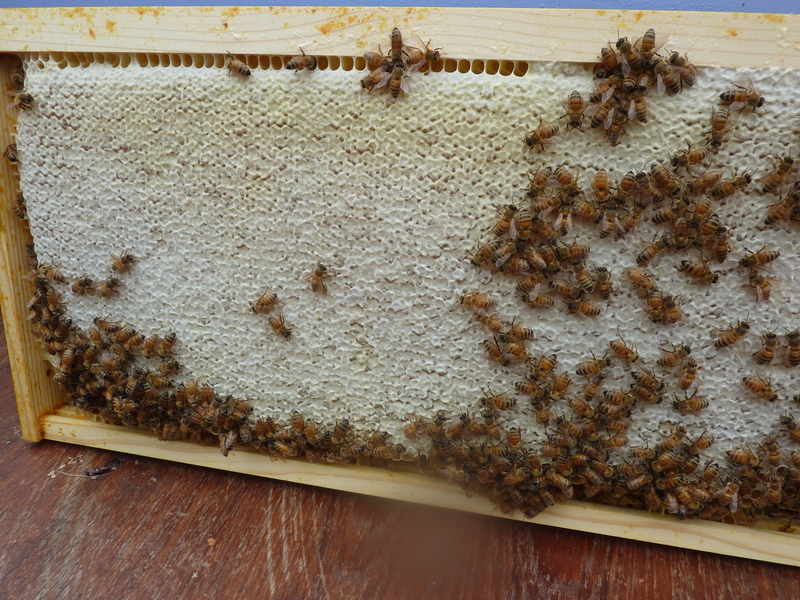 Keeping my fingers crossed, I put a honey super on the hive to give them more space, then left them alone for a few weeks. It would take some time for the new queen to hatch, mate, and start laying eggs–providing she’s actually able to mate and return to the hive and doesn’t get eaten by a bird or something in the process. Finally checked again this past weekend: No sign of a queen, no eggs, and nothing but nectar and honey. They hadn’t even started to draw comb on the honey super on top, either. Not good signs at all. If there were a new queen, I think she should have been laying eggs by now. 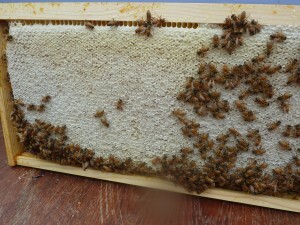 The photos below are of a frame completely filled with capped honey. That’s pretty much what every frame in the two deep boxes looks like. While it might sound awesome to have that much honey, those boxes should be full of eggs and baby bees. A bee only lives 3-4 weeks. If they don’t get a new queen soon and start building up the population again, the entire hive will die out. Commence the search for a mail-order queen. A note to anyone thinking of starting a hive: Be aware that the deep box full of honey at the moment weighs between 70 and 80 pounds. I could barely handle it. A box full of bees isn’t something you can just toss around; you need to set it down gently and, most important, not drop it when you’re moving it around–which I almost did. I should have listened to suggestions I read to either go with 8-frame hives (as opposed to standard 10-frames) or use all medium boxes instead of deeps for the brood chambers. If/when I expand to more hives, I’ll likely go with all mediums. That will mean I’ll have to be even more vigilant in making sure they have enough space to expand. But I’ll take that over dropping a box full of bees and honey. Oh, I’m sorry they didn’t manage to raise a new queen for the hive. This crazy weather has everything topsy-turvy. Someone just told me today to give them a little more time. So maybe I’ll check this weekend and miraculously see eggs. 🙂 We’ll see.